Along this journey, we ran into a few hiccups with Facebook’s setup. This post will cover a few of those hiccups. Facebook will provide the basics of the Facebook location page setup process. This post will help you solve some minor issues along this path. Ask Facebook for access to Business Locations. Once granted, continue…. Be a super admin (business manager) or owner of all pages (or have login info for all pages). Have a parent brand page, without an address, in addition to location pages with addresses. 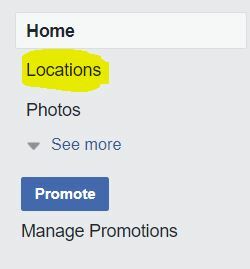 In the process, Facebook asks you to add a new location, choose a location page or upload your locations. We are looking at choosing location pages that already exists. Change all the location page names to be the same as the parent page. You can change your page names in the About tab. This is scary, but there is a solution to get the location differentiator back! Example, your store is called Blue Moon and you have 3 locations. Ideally, you would like your page name to be Blue Moon – Dippertown, Blue Moon – Skyville, and Blue Moon – Galaxyland. Facebook says the dash is good and works, but it doesn’t work, get rid of the dash and locations. Remove the locations in the page name, so they all say Blue Moon (we will add them back). But, make sure the URL shortlink does include those location names (this can be changed in the About tab too). Either choose the pages or you can create the excel import file. Facebook support is very good about helping with the location page imports. Once you have the locations all tied to the main parent page, you can go to your Business Locations manager and change the names of the pages to include the location next to the name. Now, your location pages will look like so… Blue Moon (Dippertown), Blue Moon (Skyville), and Blue Moon (Galaxyland). The locations will auto-append themselves to the page name. Tip: If and when you are mentioning the page @Blue Moon (Galaxyland) in a post, all three pages will show up as @BlueMoon. To solve this, add the location name in text next to each mention. Tip: You may have trouble changing your page name in the About tab. Facebook tells you to wait so many days before you can change a page name again. Just reach out to Facebook support, explain your dilemma and they should be able to help. They were very accommodating to our issues. Tip: Facebook likes to close tickets fast, be aware over the weekend, if you don’t respond to them asap, they close your issue. Good luck setting up your Facebook location pages, and have fun!